Big Horn River-Nowater Creek Watershed Plan NEW! In a state as arid as Wyoming, water is literally the life blood of the area. Testing the health of that life blood is part of a water monitoring program that was undertaken by the Washakie County Conservation District (WCCD). The water monitoring program began because of the 1996 listing of seven streams in Washakie County on the Wyoming Department of Environmental Quality's (WDEQ) "needs monitored" list. The listing of these streams was not justified due to lack of scientific data to prove they were impaired, but could not be removed from the list unless scientific data was collected to show they were not impaired. WDEQ was scheduled to monitor local streams in 2000-2001, however, due to landowner request, WCCD employees conducted the monitoring. To allow Conservation Districts around the state to assist DEQ in gathering the water quality information needed, the state legislature allotted $367,000.00 for water monitoring training, lab analysis and equipment in 1998 and 2000, and $675,000 from 2002 to 2012. In addition, the WCCD received a grant from WDEQ's 319 funds to conduct water quality monitoring from 2005 through 2008. This funding also included an education component and provided cost share to help local residents upgrade failing and/or inadequate septic systems and to address existing or potential water quality issues associated with small non-permitted livestock operations, i.e. less than 1000 head. In order for WDEQ to accept the data collected from the Conservation Districts, the Districts followed WDEQ's protocol, which consisted of employees participating in several phases of classroom and field training by the Wyoming Department of Agriculture and the University of Wyoming and WDEQ. 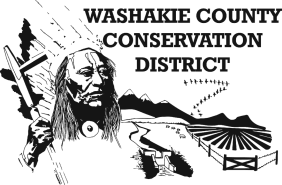 The WCCD staff began water quality monitoring on six streams in Washakie County in May, 2005. The monitoring program was focused on streams that were included on the Wyoming DEQ's 303(d) list, which included the Bighorn River, Nowood River, Sage Creek, Slick Creek, Fifteen Mile Creek, and Nowater Creek. 2005 began a monitoring schedule to gather water quality information on each site for E. coli and chemical constituents in both May and September, and a Beneficial Use Reconnaissance Program was done on three of these sites, in September. In 2006, monitoring was accomplished in August, in 2007, monitoring was accomplished in July, and in 2008, final monitoring was completed in June, except for the Nowood River. Monitoring was completed May through September on the Nowood, since this stream was candidate for the start of a delisting process. Since the month of May showed E. Coli above the standard, the WCCD decided not to keep monitoring an additional three years. The funding for this project was from a 319 grant awarded to the WCCD by WDEQ. Prior to the water monitoring each year, the WCCD updated our Sampling and Analysis Plan, where it was approved each year by WDEQ. The data indicated Chemical and Physical parameters were not problematic but there may be indications of sedimentation and hardness; Nutrients (N and P) were also generally low in concentration. Bacteria was the most persistent water quality challenge within the District. In general, it appeared that bacteria concentrations increased from 2005 to 2007 and decreased in 2008. It is the hope of the District that BMP implementation will reap benefits to our local water quality. It was also apparent that there may be a need to focus BMP efforts on Sage Creek as it is the only waterbody tested that didn't appear to be responding to BMP implementation efforts at that point in time. Determine if water quality conditions (related to E. coli concentrations) have significantly improved in Sage Creek and Slick Creek beyond what would be expected given natural variability and other factors in the watershed. Following a proposal process, the Bighorn River-Slick Creek watershed was selected by Wyoming NRCS to receive federal fiscal year (FY) 2013 National Water Quality Initiative (NWQI) funds. The purpose of NWQI is to target a percentage of a state’s annual EQIP allocation in one to three HUC12 watersheds to address agricultural nonpoint source pollution to priority waterbodies. In FY2013, the NRCS awarded $691,128 to the Bighorn River-Slick Creek Watershed to reduce bacterial loading from cropland and irrigated acres. Nine applications were funded, treating 1,089 acres. FY2014 NWQI funds in the amount of $627,366 were again provided to the Bighorn River-Slick Creek Watershed for an additional 10 contracts treating 1,229 acres. NWQI funding continues into FY2015, with an estimated 10 contracts and 928 acres to be treated. In addition, the WCCD was awarded $226,805 of FY2014 Clean Water Act (CWA) Section 319 funding through the WDEQ Nonpoint Source Program to implement additional cropland BMPs as well as range, urban, and septic system BMPs to reduce bacterial loading to Sage and Slick Creeks. These funding sources and WCCD’s coordination represent a focused effort to address water quality issues in Sage and Slick Creeks. The NWQI developed as a joint initiative at the national level between NRCS and the EPA. EPA’s contribution to the initiative was to provide monitoring resources to help evaluate and document the water quality benefits of NWQI. EPA delegated monitoring assistance for NWQI to state water quality agencies through April 2013 Section 319 program guidance. Thus, the WDEQ Nonpoint Source Program began working with NRCS and local partners in 2013 to discuss monitoring requirements and strategies. A group consisting of state and local NRCS, Wyoming Association of Conservation Districts, WCCD, and WDEQ met during 2013 and 2014 to discuss a monitoring program for Sage and Slick Creeks. Concerns about monitoring requirements, data sharing, reporting, and the use of the data were discussed. The need to address these concerns resulted in monitoring not starting in 2014; rather, monitoring was instead slated to begin in the spring of 2015. It was determined through these meetings that conservation practice information aggregated at the watershed level would be sufficient for purposes of this monitoring study; therefore, the group will not pursue a Memorandum of Understanding between NRCS, WDEQ, and other parties to enable WDEQ to be a conservation cooperator under Section 1619 of the Farm Bill to allow data sharing at smaller scales than the watershed level. It was also determined that it would be preferable for WCCD to conduct the monitoring, with WDEQ providing assistance as needed. This SAP, therefore, outlines the monitoring strategy that will be used as part of NWQI to help evaluate effectiveness of conservation practices implemented under that initiative. In addition, these monitoring efforts may help evaluate effectiveness of conservation practices implemented under other funding sources, including Section 319 grant funds. Data from WCCD’s 2005-2008 monitoring program provide a rough baseline for comparison of data collected under this program. However, comparability will be limited due to a different monitoring location on Sage Creek and different sampling schedules for E. coli following revisions to WDEQ water quality standards and sampling methods that have occurred since 2008. If comparison to previous datasets is limited, the length of this monitoring program (currently proposed through 2017), will help provide long-term trend information as conservation practices are implemented and become fully effective. The WCCD employees attended a Use Attainability Analysis training in 2009, which was hosted by the Wyoming Association of Conservation Districts. Upon returning, the WCCD completed gathering the data necessary to document the proposed change of classification from Primary to Secondary within the Nowater Creek and Fifteen Mile Creek watersheds. In addition, the WCCD completed UAA documentation on 18 sites for the Wyoming DEQ for their random site Model documentation in 2010. The Washakie County Conservation District (WCCD), to ensure that local landowners are informed of federally mandated activities, participated as a technical review team member for the development of the Big Horn and Greybull River TMDL. A TMDL study is required by the Clean Water Act when a waterbody is determined to not be meeting its assigned designated uses. A TMDL is defined as the amount of pollutant a stream can accept and still meet its designated uses. A designated use is what the water is used for such as fish, recreation, wildlife water, domestic livestock water, etc. To determine a TMDL they gather information on what point sources enter into the stream (these are permitted sources such as waste water treatment plants), what non-point sources enter the stream (these are overland flow types of sources) and they allow a margin of safety (errors in modeling).The TMDL work focused on 16 impaired stream segments in the Greybull and Big Horn River watershed. Ultimately, each stream segment was assigned a load number/allocation, which is the amount of pollutant, from any of the sources, that that particular waterbody can handle. The consultants hired by the Department of Environmental Quality (DEQ), to conduct the TMDL study included RESPEC out of South Dakota, which also subcontracted with WWC Engineering out of Sheridan, Wyoming to do the data compilation. No one is certain where the majority of E. coli is coming from, whether it is wildlife, whether it is in the sediment and has been there for years and gets stirred up when disrupted, or whether if it is caused by man (septics, livestock, etc.) We suspect that overland flow from rain showers and snow melt is part of the culprit, which puts us back to wildlife and possibly livestock operations that are too close to a stream. There has been a tremendous amount of work done in this county with moving feedlots, correcting failed or old septic systems, and assisting with cost share to install BMP's by both NRCS and the WCCD, over the past 10 years. The WCCD will continue to help fund and support other efforts for funding of those projects, but only if those landowners voluntarily come to us for help. These regulations can certainly put a livestock operation out of business because of the cost of upgrading their corrals and we know they understand (and we can help them understand) the health issues of E. coli in the water if citizens ingest that water.